In 2017, Montréal’s Olympic Park implemented a new entry process at the Olympic Stadium, by moving the search points outside for big events. This will be the case for the Monster Spectacular show on Saturday, April 6, as well as for all upcoming spectator events. People arriving via the Pie-IX metro station will need to make their way outside and across the Esplanade to enter the Stadium. Members of the public will be directed by a team of logistics personnel deployed all over the Olympic Park site to help guide them toward the entry points. This new approach is consistent with the entry process used by large stadiums across North America as well as with the policies adopted by professional sports leagues, whereby all access controls are located outside the stadium. This will help reduce the waiting time and allow the crowd to move quickly, thanks to the search lanes spread over the Esplanade and in front of Jackie Robinson Place at 4545 Avenue Pierre De Coubertin. For transit users: Two metro stations serve the Olympic Stadium (Pie-IX and Viau). As soon as you arrive at the Pie-IX metro station, you will be directed outside, where greeters will guide you to the Esplanade, which is accessible to pedestrians by means of two entry points: via ramps facing Desjardins, and Bennett streets. Two search points will be set up on the Esplanade and an additional one at 4545 Avenue Pierre De Coubertin. For motorists: All the parking lots at the Olympic Park will be operational. Motorists are invited to use the P1 and P2 parking lots on Avenue Pierre De Coubertin, the P3 parking lot on Boulevard Pie IX and the P4 parking lot on Sherbrooke Street. Quick Tip : Use the P3 Pie-IX and P4 Sherbrooke parking entries for quicker acces to the Stadium. Searches will be conducted prior to entering the Rotunda. 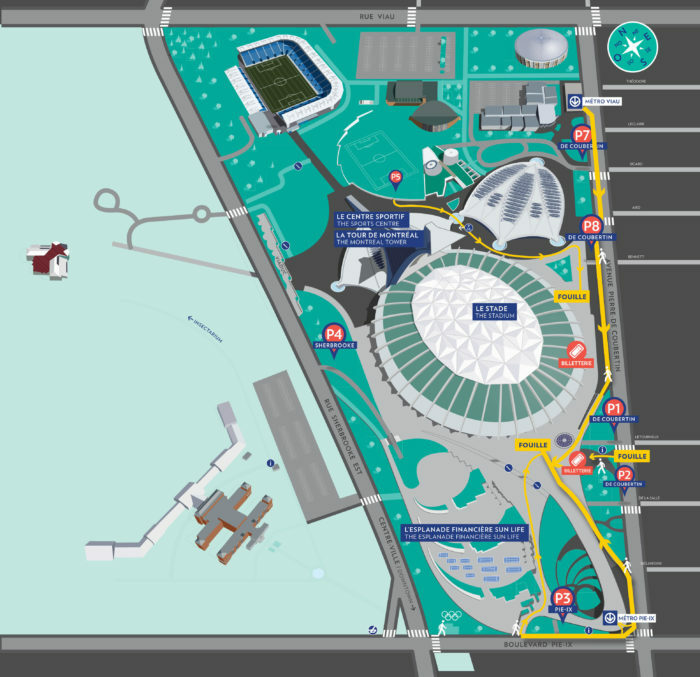 See the map below for details regarding access to the Olympic Stadium.